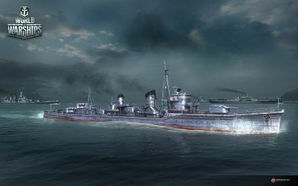 Kagero — Japanese Tier VIII destroyer. Dropping down from Tier IX as a part of the Japanese destroyer line changes in Update 0.5.15, Kagero now fills Fubuki’s old spot at Tier VIII. Fans of the old Fubuki and new captains who have moved up from Akatsuki will find Kagero familiar in many ways. Both should be accustomed to the A-X-Y turret arrangement of the main battery, her handling characteristics are nearly identical (similar turning circle radius and rudder shift time), and her anti-aircraft suite is still hardly worth mentioning. So, what's new? For starters, Kagero’s guns reload faster, though they do give up some range to those of Akatsuki and pre-0.5.15 Fubuki. This gives her more of a fighting chance when cornered by an enemy gunboat destroyer (such as Benson), especially if said enemy is already wounded. With that said, however, captains who have progressed this far up the line should know by now when to hang in a gun duel against an enemy destroyer and when discretion is the better part of valor; never court a gunfight with an American or Russian destroyer with lots of health. Kagero’s detection radius is improved over both old Fubuki and Akatsuki; not only can she can equip Concealment Module 1 (as a Tier VIII ship), but her base detection radius of 6.8 km is the lowest of all high-tier Japanese destroyers. Kagero has some fairly glaring deficiencies compared to her counterparts at Tier VIII, though. Her speed is fairly pedestrian, her anti-aircraft guns are ineffective at shooting down enemy planes, and her main battery reload and turret traverse times are painfully slow. Just like Akatsuki, captains are likely to miss the tremendous tactical flexibility of Fubuki’s three torpedo launchers. As nasty as her upgraded torpedoes are — and they hit very, very hard — their reload time means that getting off more than a few salvos in a match is tough. Luckily, Kagero can give up Smoke Generator ( ) in exchange for Torpedo Reload Booster ( ). This allows her to force an 8-second reload time on her torpedoes once every six minutes (or four, with the premium version). Given her best-in-tier detection radius, this will be a worthwhile gamble for many captains. The Japanese destroyer line becomes challenging to excel in at high tiers, but Kagero provides all the tools necessary for captains to do just that; they need only bring patience and a willingness to learn how to handle her. Lowest detection range of all Tier VIII destroyers. Fast, powerful torpedoes that hit like freight trains. Good handling; same turning circle as her predecessors, quick rudder shift. Gains access to Torpedo Reload Booster ( ), allowing her to launch 16 torpedoes within 10 seconds. Mediocre top speed of 35 knots. Main battery is slightly improved from Akatsuki, but is still nothing special. Painfully long torpedo reload time, regardless of which torpedoes are equipped. Has to choose between torpedo reload booster or the smoke screen consumable, unlike Akizuki. Hull (B) is unquestionably the most important upgrade for Kagero; the extra hit points provide her additional survivability. The Torpedo module is a fairly minor buff to her fish; the Fire Control System module might actually be better to pick-up first. Captain's pick for this one, there's not really a wrong answer. As a Tier VIII ship, Kagero gains access to Slot 5; Concealment System Modification 1 is the logical choice for the new slot. Her other upgrade recommendations remain largely as they were for Akatsuki: Main Armaments Modification 1 in Slot 1, Aiming Systems Modification 1 or Main Battery Modification 2 in Slot 3, and Propulsion Modifications 1 and 2 in Slot 2 and Slot 4, respectively. Kagero captains must choose between equipping Smoke Generator ( ) and a downgraded version of the Torpedo Reload Booster ( ) consumable that Shiratsuyu and Akizuki have access to. Whichever one is chosen, captains are encouraged to invest the credits (or doubloons) in the premium version. As ever, investing in Damage Control Party II ( ) is also highly recommended. Engine Boost II ( ) might be worthwhile for captains without Smoke Generator ( ); otherwise, the free version should be more than adequate. Players who wish to spend doubloons can equip Kagero with Type 18 camouflage that lowers her detection radius, reduces the accuracy of incoming shells, reduces her repair costs, and increases the amount of experience she earns. Kagero also has an alternate premium camouflage called "Urashima", in which she appears as she does during the Halloween scenario "Sunray in the Darkness". Kagero fires her torpedoes at incoming enemy ships. Kagero launches torpedoes at an enemy Tirpitz and Friedrich der Große from within her smokescreen. Kagero speeds towards the enemy capture point under the cover of a cyclone. Kagero runs into an enemy Iowa and Roon. 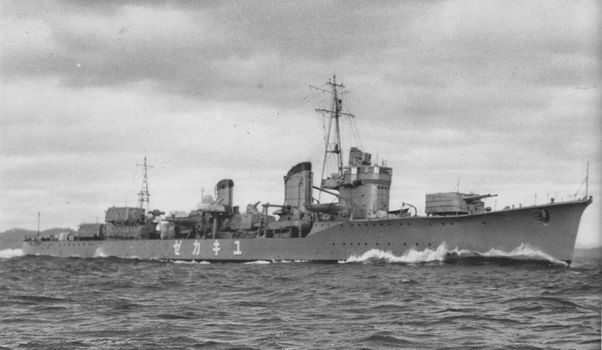 Kagero-class destroyer Yukikaze underway, December 1939. Stille, M. Wright, P. (2013). Imperial Japanese Navy Destroyers 1919-45 (2): Asashio to Tachibana Classes. London, UK: Osprey Publishing Ltd. This page was last modified on 18 October 2018, at 06:36. This page has been accessed 68,677 times.